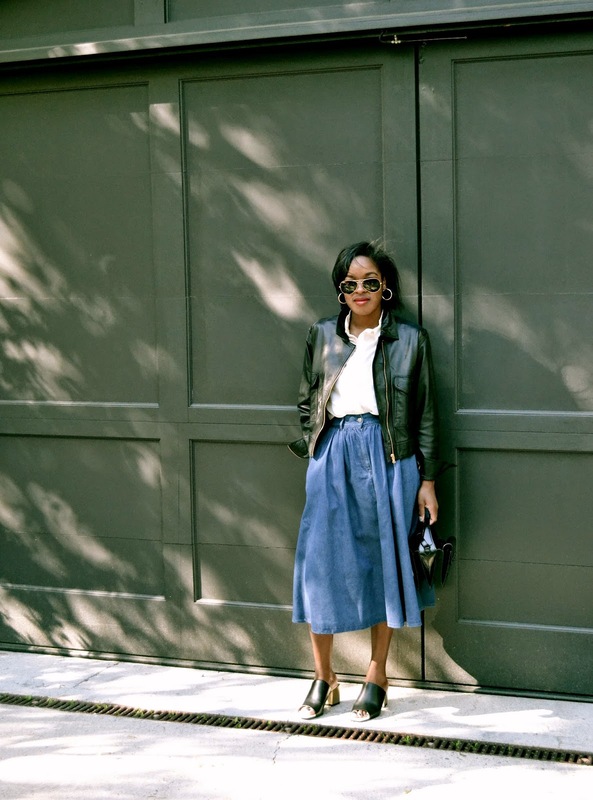 Normally, as some of you have become aware of judging by the photogenic evidence on the Chicest Degree, it’s very unlikely to see me in a skirt. My daily sartorial pairings usually consist of a boyfriend jean with a button-down, blazer, and trainers or Birkenstocks. For a while now, I’ve been on the hunt for the perfect full length skirt after viewing Tibi’s spring/summer collection, in denim of course. The reason being for the simple fact that denim is the one thing to never go our of style, whilst looking the best paired with just about anything in your existing wardrobe. As of late, I’ve been extremely into minimalist dressing. Simple and easily wearable essentials paired together that make a subtle statement. This ensemble is a combination of a few of my recent pieces that have been purchased from the high-street and my most valued designer pieces in my closet currently. 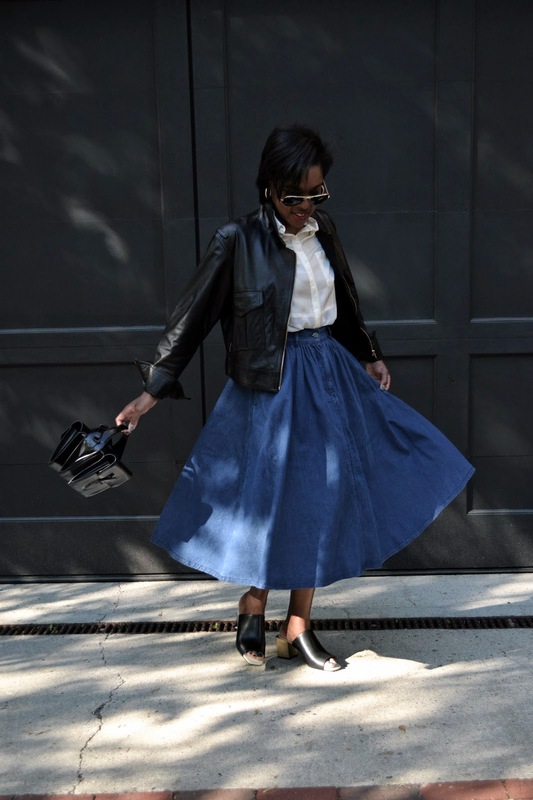 Leather is something I tend to gravitate more towards when the weather begins to get nicer and a classic button-down with a full denim skirt paired with this seasons most coveted shoe, the mule, is the perfect balance of nonchalance. 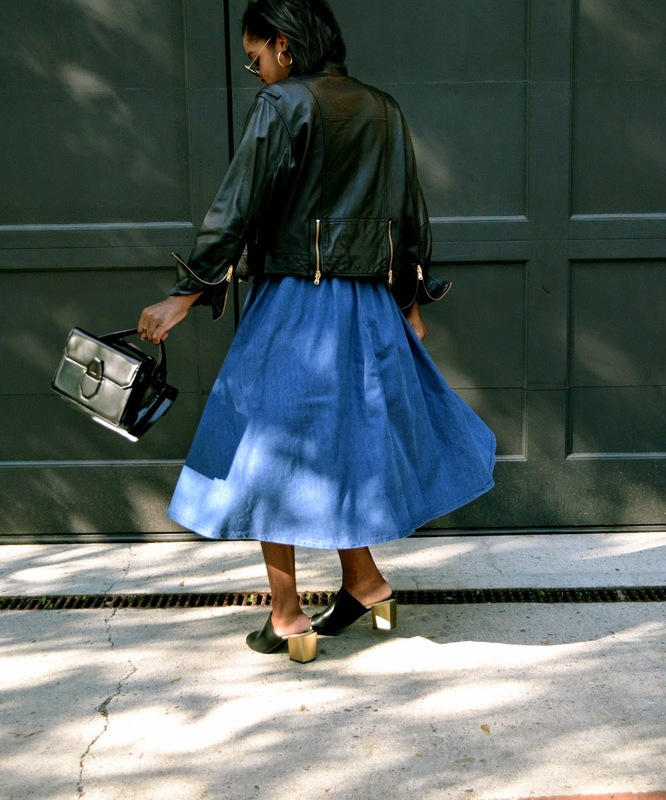 Marc Jacobs leather jacket, Equipment button-down, H&M Trend denim full skirt (In stores now), Zara leather wide heel mules, Alexander Wang ‘Racketeer’ satchel.